Zootopia is respectable animated fare - not nearly as good (or memorable) as the best of Disney/Pixar but significantly better than the majority of quick cash-grab offerings thrown out by studios to dominate the family film market. Although Zootopia’s thematic underpinnings of inclusiveness and empowerment are adequately demonstrated by the narrative, the movie doesn’t integrate them with the effectiveness of a Toy Story, Wall-E, or Inside Out. Nevertheless, it boasts appealing characters, some great individual scenes (even if the overall plot is a little threadbare), and a fascinating (if underexplored) milieu. There’s a lot here for kids to like and nearly as much to keep parents from fidgeting. As implied by the title, Zootopia transpires in a fantasy utopia inhabited by anthropomorphic animals (not exactly something new in animation) who have learned to live together in harmony. Predators have suppressed their instincts, enabling them to work and play alongside the creatures they used to rely on for dinner. Zootopia is the largest city in the world, a magical destination for many and, when would-be bunny cop Judy Hopps (voice of Ginnifer Goodwin) travels there to fulfill her dreams, she’s met by the reality that the city’s “perfection” falls a little short. And, although she’s the first rabbit on Zootopia’s police force - a victory for Mayor Lionheart’s (J.K. Simmons) diversity agenda - Chief Bogo (Idris Elba) isn’t convinced of her capabilities and assigns her to meter maid duty. Not content with handing out tickets, Judy begins investigating a series of animal disappearances. This causes her to form an unlikely partnership with a con-artist fox, Nick Wilde (Jason Bateman), and encounter a plethora of oddball characters on her way to solving the case. Judy falls into the “plucky, can-do” heroine mold - a favorite of Disney’s. She isn’t a princess, though. Quite the contrary - she’s a working girl struggling to make ends meet. She sleeps in a low-rent apartment with a thin mattress and thinner walls. Viewers, especially young girls, will appreciate her attitude: she’s relentlessly optimistic and, even when things aren’t going her way, she pursues her dreams rather than accepting her current situation. She’s a high-energy character - something highlighted in a scene where she has to deal with the (literal) sloths at the DMV. This sequence, which was used in Zootopia’s early trailers, illustrates all we need to know about Judy while offering a blistering satire of a much-hated institution. Ginnifer Goodwin provides an “anonymous” but cheerful voice. Three of Zootopia’s voice actors are immediately recognizable: Jason Bateman, who plays Judy’s unofficial partner; Idris Elba, who portrays a stereotypical tough-guy cop; and J.K. Simmons, whose vocal stylings are suddenly in demand (he’s also in Kung-Fu Panda 3). Another notable inclusion is Shakira, who contributes musical numbers as the superstar singer Gazelle. Animated veterans Kristen Bell, Tommy Chong, Bonnie Hunt, and the versatile Alan Tudyk also lend their talents. Zootopia isn’t designed with crime/detective movie fans in mind. Instead, this is more of a classic mismatched buddy film with Judy and Nick learning to respect one another as they gain an understanding of each other’s strengths. Any lessons about diversity are carefully camouflaged by showing animals of different species getting along. There’s enough humor for this to be considered a “comedy” and, as is usual for Disney (and Disney/Pixar) films, a few of the jokes are intended for older viewers. 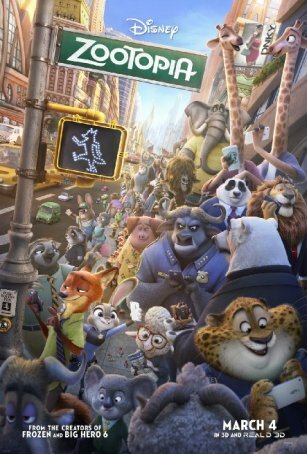 Without the backing of a well-established brand, Zootopia may struggle to capture the large audiences attracted by a Kung-Fu Panda 3 but the Disney name and the long gap until the next animated feature (mid-May’s The Angry Birds Movie) could allow this movie to introduce its own franchise. I wouldn’t mind a second visit to this world and another ride-along with Judy and Nick. They may not be iconic but they’re pleasant company.